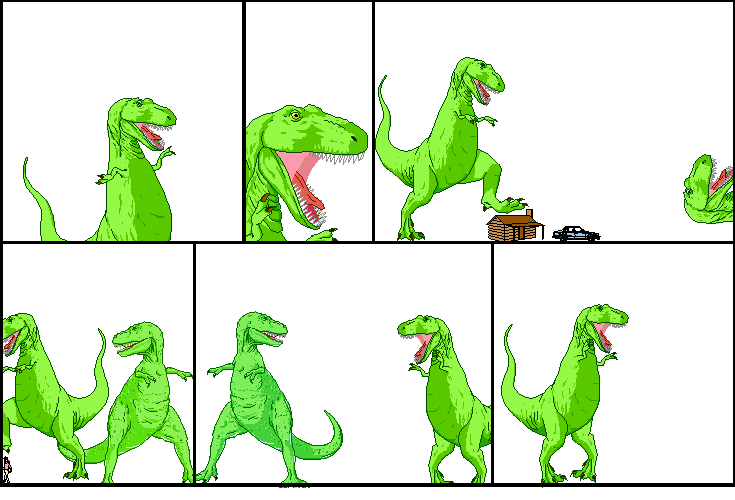 Dinosaur Comics - August 9th, 2012 - awesome fun times! –In THIS story, dinosaurs die out and millions of years later humans take over! August 9th, 2012: Oh wow you know what we haven't done this year yet? FEEL FREE TO TALK TO ME IF I'M WEARING A DINOSAUR COMICS SHIRT DAY. Inspired by a chance meeting of two shirt-wearing people, this event is the one day when my shirts get semantically-overloaded as a conversational opener! Last year we did it in December for the Australians, but I didn't hear about ANY of them hooking up, so it's summer again for North America! One year ago today: "an unfair universe" = i described the premise and none of my friends dropped everything to make it happen, THANKS FOR NOTHING "PALS"